● Uniqueness- Be the cool person in town that grows their own eggs! Search our Buy Sell Trade section for members selling hatching eggs or chicks. 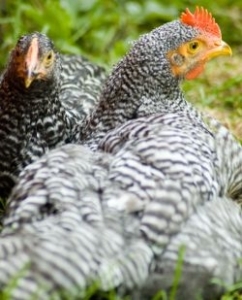 Check our list of chicken suppliers. Young Chick Brooder – Can be as simple as a sturdy cardboard box or a small animal cage like one you’d use for rabbits. Temperature – 90 to 100 deg. for the first week, decrease 5 deg. per week. A 100 watt bulb pointing in one corner (not the whole brooder) works well. Play time – Play with your chicks when young to get the use to being around people. 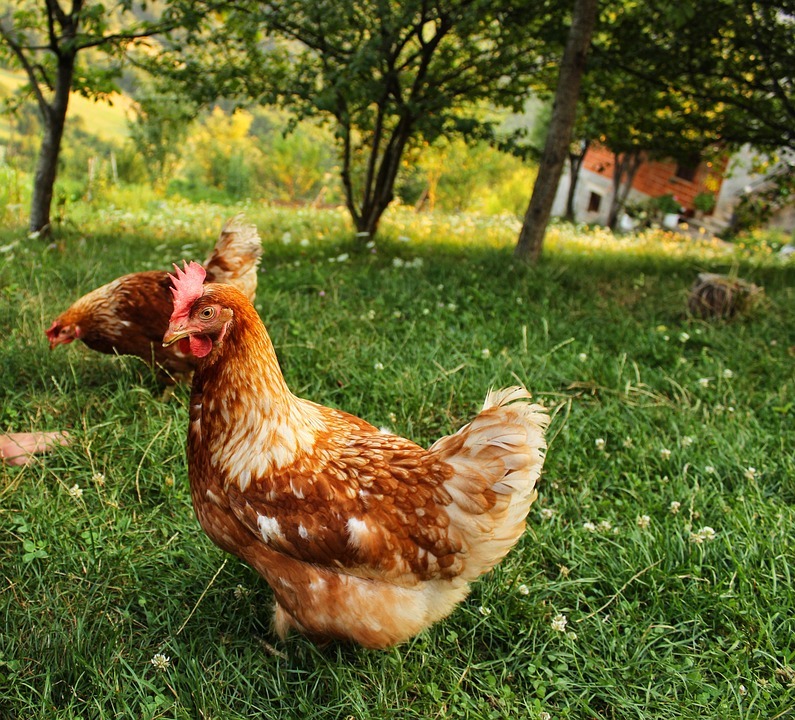 Outside time – Section off an area in your yard where the chicks can explore, scratch, etc. Make sure you can catch them when it’s time to come in. 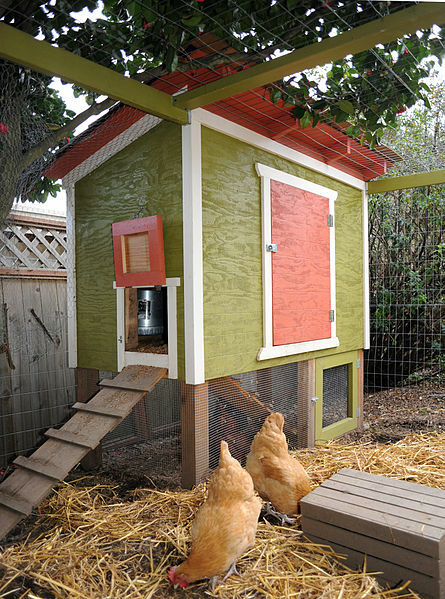 Chicken Coops – Once featherd out you’ll need to move your chickens into a chicken coop! Rule of thumb is about 3 – 4 sqare feet per chicken. Keep local predators in mind and make a safe home for your flock! Flooring – Pine shavings still work best. You can even try the deep litter method for even less maintainance. First things first – eggs should hatch in 21 days, give or take couple, after the hen has begun to “set” or incubate them. Before putting your eggs into an incubator, plug it in and make sure the temp is steady at 99.5 degrees. I use a thermometer and a hygrometer (which measures humidity) in my incubator. Hygrometers can be purchased quite cheaply at a cigar shop, Radio Shack and I believe even Walmart. You want 50% humidity for day 1-18, then 70-80% for the last few days. Mark eggs, using a pencil, with an X on one side and an O on the other. Make sure to turn the eggs at least 3 times a day (turn an odd number of times a day). You cannot skip weekends – you might get deformed chickens or none at all. You must keep adequate moisture in the incubator at all times. A couple of small paper cups or a pie pan (with water in them) will do nicely for your moisture supply. Or, just follow the directions that came with the incubator. Note: Some people report good success and excellent hatch rates with no-turn hatches. I happen to enjoy the personal connection and turn them myself. 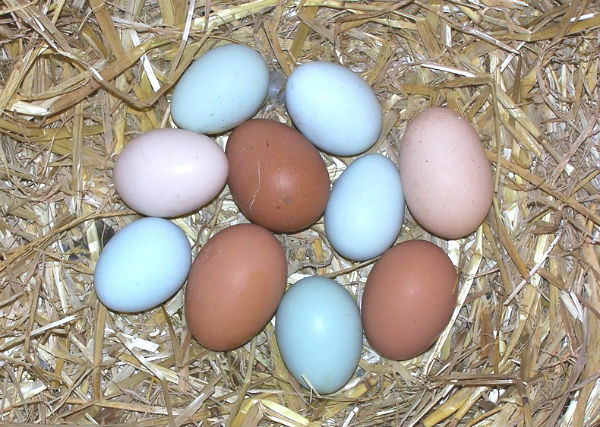 An incubator keeps the eggs uniformly warm and moist, as it would be under a hen’s tummy. If you’re going to buy one, there are lots of options, depending on capacity, features (auto-turning and such), and your budget! Natural fertility is rarely 100% – it may vary from 55% to 95% with season, condition and type of birds. You might be safe to expect that 50% to 75% of the fertile eggs will hatch. Eggs that aren’t fertile, or if incubator conditions are too far off won’t hatch. Fertility of eggs cannot be determined before incubating them. After 2 to 3 days, white-shelled eggs may be candled to see if embryos have developed. Cracked or damaged eggs usually do not hatch and often develop odors – they should be removed when detected. Uniformly colored or white-shelled eggs may be candled by placing a light bulb under a box or can. Make a hole slightly smaller in diameter than the egg through which light will pass. Place the egg over the hole, if a cloudy spot or mass is observed, this can be assumed to be a growing embryo. If the contents of the egg allows light to pass uniformly through it (it’s clear), assume that the egg is infertile. If an egg is candled at 7 days or older and is absolutely clear, it is dead or was never fertile. Soon after an egg is laid, a small air bubble forms in the large end under the shell. 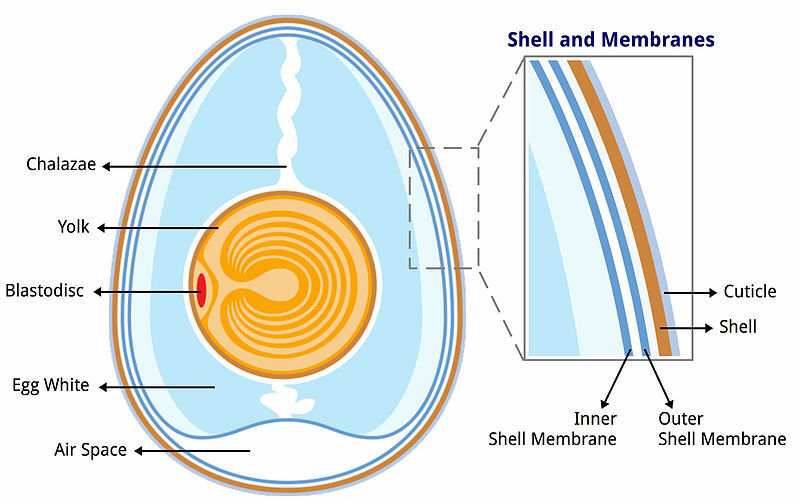 A membrane separating the mass of the egg and the air bubble moves back and forth to relieve stress and pressure on the embryo resulting from changes in temperature. The drier the outside air is, the more fluid is depleted and the faster the bubble grows. Correct humidity in the incubator insures that the bubble does not grow too big, depleting essential fluids, or deny the chick enough air by remaining too small. The importance of correct humidity is more apparent at the end of incubation. The normal condition is that the bubble has enlarged to the point where the chick can reach his beak through the membrane wall and pick around the shell, breaking the bubble area off as a door. If humidity has been excessive, the chick may not reach the bubble but will pip the shell in the fluids under the bubble and may drown at that moment, before she is able to go any further with her effort to release herself from the confines of the egg. On the other hand, if humidity has been too low, the bubble will be oversized and the fluids under it will have dehydrated to the point where final development of the embryo will be retarded and the chick may become stuck to the shell when it pips. In this condition, the chick will exhaust itself, unable to get out of the shell. After half a day, a chick that is stuck to the shell, after pipping, may be released by pulling the top of the shell off. An incubating egg should set in a normal position as it would on a flat surface; that is with the large end slightly higher than the point. An egg that persistently has the small end elevated may cause the embryo to be misoriented with the head toward the small end. In the misoriented position, the chick is likely to drown on pipping. Therefore, it is quite important that in general, the large end of eggs should be slightly higher than the small ends; or as they would lie naturally on a flat surface. Turning 3 times a day seems to be adequate for chicken eggs. Turning is essential in the early stages. For the last 3 days of incubation when the bird is preparing to hatch, do NOT turn. If not turned to a fresh position frequently during the early stages, the developing embryo touches the shell membrane and sticks to it causing abnormal growth. Turning the egg aids these movements within the egg, and mimics what a mother hen would do naturally. A fresh egg takes up the temperature of its surrounding, but as development proceeds the embryo generates its own body heat. By hatching time, it has an internal temperature. Chicken eggs should incubate at 99.5 degrees. The embryos are extremely sensitive to overheating; if the temperature strays beyond 103 degrees for any length of time, the embryos may be damaged or die. Do not be in a hurry to take chicks out of the incubator. Gallinaceous birds, such as chickens, quail, and pheasants survive up to 3 days without feed or water. The yolk of the egg is drawn through the navel into the stomach of the baby bird before it hatches. That provided enough nourishment for the transitional period from the time the bird hatches, fluffs out, gains strength and becomes active enough to go out and seek food. Chicks continue to grow and develop in the incubator, before they receive food. Of course, they do not gain weight, but they do gain in stature, activity and use of their faculties. They will instinctively be interested in drops of water, each other’s toes, and other objects of possible experimentation. Do not assume from these evidences of interest that the chicks are hungry. It is simply nature’s way of experimentation, exploration, and learning of the young. In general chicks are taken from the incubator after 24 hours. No harm is done if they are not taken out for 48 hours after they hatch. Feed and water must be available at all times from the time they are out of the incubator. Do not dole out a measured daily ration. Do not let feed or water run out! Baby birds should be fed a dry mash. Chicken and pheasant chicks do well on baby chick mash. Solid grains are not suitable for feeding baby birds. No grit is needed when a mash feed is used. Best source is a poultry feed store. Water receptacles are a problem with baby birds during their first week, in that if they can, the birds will drown themselves. The urge to get into water is thought to be related to the fact that the birds are fresh out of the fluids of their natural environment. The younger the bird is, the stronger the urge to throw herself completely into any water that is available. After a few days, certainly a week, this instinctive compulsion to flounder in water disappears. A common device to prevent drowning is to use a shallow water cup with marbles set in the water over the entire drinking area. The chicks will drink in the spaces between the marbles.